TX Text Control .NET for Windows Forms supports 100+ formulas, including most mathematical and trigonometric formulas compatible to Microsoft Excel. Typically, a SUM formula is inserted at the end of a table to create a total sum value. TX Text Control .NET for Windows Forms X16 enables document collaboration features in your application. Track Changes, also known as redline, or redlining, is a way to keep track of the changes different authors make to a document. These changes can be accepted or rejected by the authors to collaborate on the same document. TX Text Control .NET for Windows Forms X16 remembers these changes, and stores them MS Word compatible in the document. Changes are visually marked in the Text Control editor and also available in the new sidebar Tracked Changes that lists all changes with a timestamp and author information. This allows multiple users to collaborate by working on the same document. Not only interactive changes can be tracked, but also programmatic changes that are done using the Selection object and based on the currently active user. All changes within the text are also visible in the sidebar and accessible programmatically using the API. TX Text Control .NET for Windows Forms X16 supports calculations in a table by using formulas. A formula is a property of a table cell and can be loaded from a SpreadsheetML document or can be inserted using the TXTextControl.TableCell.Formula and TXTextControl.TableCellFormat.NumberFormat properties. TX Text Control .NET for Windows Forms X16 supports 100+ formulas including most mathematical and trigonometric formulas compatible to Microsoft Excel. 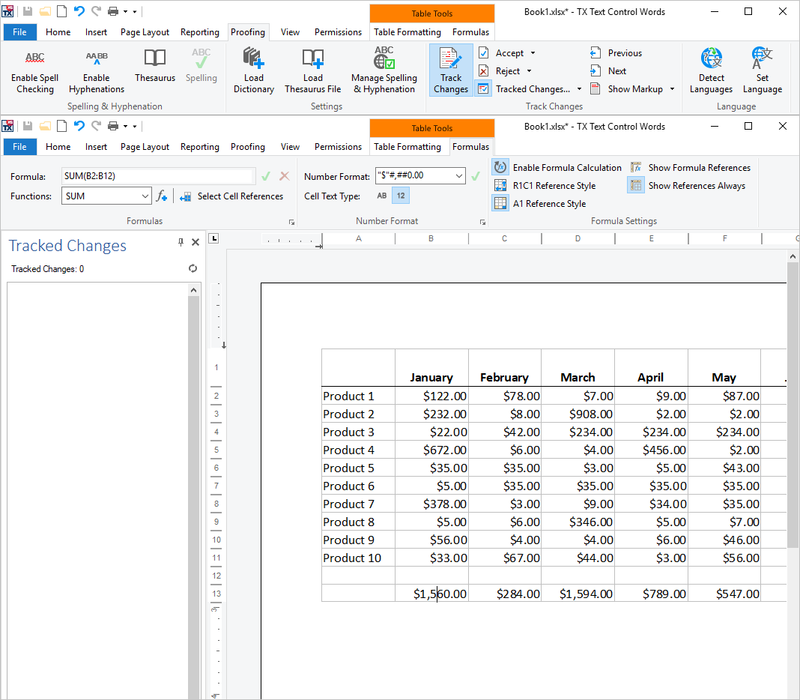 Formulas can reference other table cells and the text content of a formula cell is automatically updated when the content of an input cell changes. TX Text Control .NET for Windows Forms X16 supports data shaping to filter and sort data rows in a MergeBlock. The UI (ribbon and dialog boxes), which is available out-of-the-box, reflects these new improvements. The Insert Merge Block dialog box, that inserts a new merge block based on the connected data from the TXTextControl.DocumentServer.DataSources.DataSourceManager , has a new button to specify data shaping settings. All of these settings can be set programmatically using the new properties of the TXTextControl.DocumentServer.DataSources.MergeBlockInfo class: SortingInstructions and Filters. Additionally, the BlockMergingCondition specifies a condition which the parent data row of this merge block has to satisfy, so that this merge block is merged at all. This enables very flexible data structures and data shaping options in TX Text Control based reporting applications. TX Text Control .NET for Windows Forms X16 supports the SpreadsheetML part of the Microsoft Office Open XML format. This format is a ZIP compressed XML format for spreadsheet processing and is used as the standard format of Microsoft Excel. TX Text Control loads the *.xlsx format from physical files or from memory containing documents formatted with this format. The TXTextControl.StreamType enumeration has been extended with the new SpreadsheetML member. The method TXTextControl.LoadSettings.GetDocumentPartNames returns the names of all document parts of the specified document. Each SpreadsheetML document can contain multiple named worksheets. Using the TXTextControl.LoadSettings.DocumentPartName , the worksheet to be loaded can be defined. The Proofing ribbon tab has been extended with a new Track Changes ribbon group, containing buttons to turn on and off tracking changes, to accept and reject tracked changes and to scroll to the next or to the previous tracked change. The Table Layout tab has been extended to support formulas and number formats in table cells. 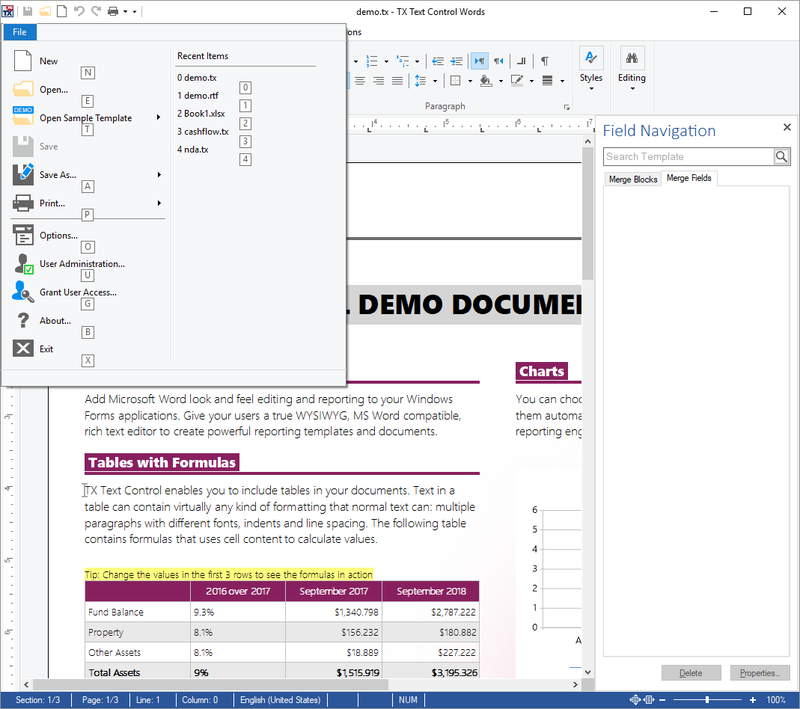 TX Text Control .NET for Windows Forms X16 offers a TXTextControl.Windows.Forms.Sidebar control that can be placed inside an application and used as an alternative to dialogs. It can be pinned and unpinned to display the control as a docked sidebar or as a dialog. Besides the option to create a custom interface, the sidebar provides different pre-defined functional layouts that can be connected to a TextControl. Furthermore, horizontally and vertically docked sidebars can be used with specific ribbon tabs, where the user can toggle a related button to show or hide that control with the corresponding application. Key tips are now available for all ribbon drop down controls including the application menu. The new TXTextControl.Windows.Forms.Ribbon.RibbonForm.HasQuickAccessToolbar property defines whether a quick access toolbar is shown in the caption area of the form and the new TXTextControl.Windows.Forms.Ribbon.Ribbon.HasApplicationMenu property defines whether the first tab of the ribbon is an application menu.